Other Products by Cytosport. Search other Protein Powder products. Cytosport CytoGainer contains ultra high-quality whey proteins along with complex carbohydrates to create the ultimate lean muscle maximiser. Specially designed to maximise lean muscle gains Cytosport CytoGainer combines muscle building partially digested glutamine peptides with whey peptide fractions shown to help increase insulin-like growth factor and the branched chain amino acids for enhanced protein synthesis and thus muscle growth. Containing only complex carbohydrates specially designed to provide a rapid delivery of nutrients into the muscle tissue to initiate the recovery process along with Creatine to fuel muscles after high intensity workouts and Glutamine to prevent catabolism (muscle breakdown) Cytosport CytoGainer provides the necessary nutrients to pack on lean muscle gains. Cytosport CytoGainer is 98% lactose free to prevent gastrointestinal stress, low in sugar and 97% fat free so your gains are dense, full, hard muscle. Mix 4 scoops (150g) in 450ml of cold water (provides over 600 low fat calories). For more calories (approx. 900) mix Cytosport CytoGainer as above in 2 cups of low fat milk. 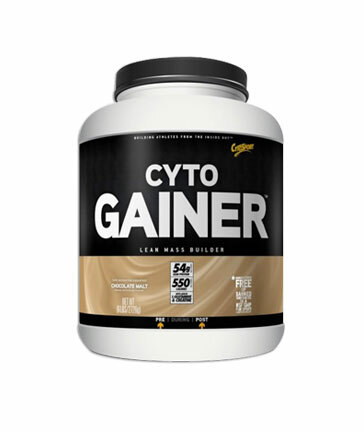 Take CytoGainer immediately after workout to shift the body from catabolic to anabolic. Use three servings per day.